Matwork is the true foundation of the Pilates method. From classical to contemporary repertoire, these classes will create strength and length within the body. With exception of the Advanced Matwork class, all matwork class formats are open level and our instructors are trained to accommodate each and every body. Explore the different pieces of Pilates apparatus – Reformer, Cadillac, Wunda Chair, Ladder Barrel, Step Barrel – in the group equipment classes. The fundamentals developed through matwork will be applied to more complex and coordinated movement to create a new challenge. All classes are open level, though we highly recommend taking a few private Pilates sessions if you’ve never used the equipment before to develop comfort and familiarity with the apparatus. Private and semi-private Pilates sessions are designed to the needs of the individual. Through your practice, you will explore repertoire on the mat and all apparatus. Each session will address all parts of the body to create balance and flow. If you struggle with injury or imbalance, our instructors are trained to modify each and every exercise to create optimal results. During and after pregnancy the body experience significant change - hormonal, physical, and emotional. Pilates can provide a strong foundation for your body through this time. Through specific exercises and modifications, you will strengthen your transverse abdominus and pelvic floor muscles to prevent diastisis recti and increase core strength and stability. Additionally breath work with help to prepare you for birth. Post partum clients should get clearance from their doctor before returning to exercise, and we recommend that you wait 6 weeks if you had a cesarian delivery. Babies up to 6 months old are also welcome in the pre natal and post partum classes! 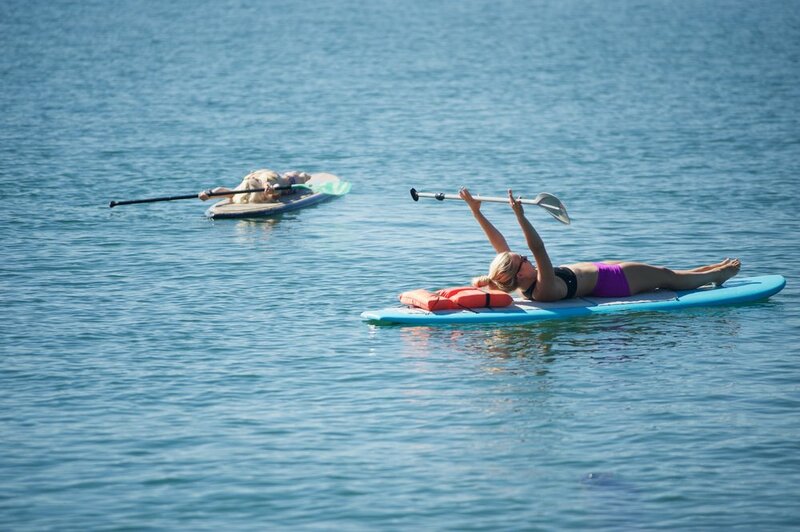 Challenge your balance and enjoy the beautiful outdoors that Flathead Lake has to offer with our SUP Pilates class. The instructor will lead you through a 50 minute open level matwork flow. We have partnered with Paddle Board Outfitters to provide boards, but if you wish to bring your own please do! Classes are located in Somers Bay on Flathead Lake. Please arrive 10-15 minutes early to ensure an on-time class start. From elite athletes to special populations, we can create a Pilates program tailored to your group’s needs. All series classes will run for 4 or 6 weeks and are prepaid. This allows your group to progress together and creates accountability. If you’re interested in setting up a specialty series, please send us an email or give us a call! Bachelorettes, birthday parties, or whatever the occasion may be, we would love to host your next party at Space Pilates! ou will have the studio all to yourself, group instruction, and of course bubbly. Different packages and pricing options are available so please contact us directly if you’re interested and we will get you a quote.